Even Trader Joe’s has a generic store brand. The Trader Joe’s Vintage Root Beer Review was okay. 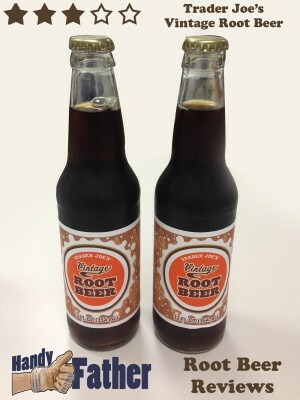 Trader Joe’s Vintage Root Beer is an all-natural cane sugar root beer. It is also a very generic root beer with no outstanding quality. Trader Joe’s Vintage Root Beer has a nice, deep color and tons of foamy head when poured into a frosted mug. The flavor is not surprising. It’s generic like a store brand is expected to be. The only issue I take is that the ingredients listed are so impressive; with wintergreen, Tahitian vanilla and others, you’d expect a more robust flavor. There is a slight wintergreen flavor, and a marshmallowy creaminess but it is weaker than I’d like. We give the Trader Joe’s Vintage Root Beer Review a score of 3 out of 5 stars. You can do better than Trader Joe’s Vintage root beer, but you can certainly do worse. It is the best tasting root beer we’ve tasted from Trader Joe’s so that’s something.